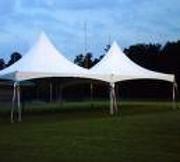 Our 20 x40 Twin High Peak tent package includes 12-6ft. rectangular tables and 72 chairs. Make sure you visit our accessories page for more items to enhance your party.